PayPal has bought iZettle, a Swedish mobile payments company that sells a card-reader aimed at small businesses, for $2.2bn (£1.6bn). The move boosts PayPal's in-store presence at a time when competition in the online payments sector is increasing. The takeover comes less than three weeks after iZettle said it would list shares in Stockholm. At the time the firm said the listing would help it raise money and expand. When complete, the acquisition of iZettle will mean PayPal has an in-store presence in 11 markets in Europe and Latin America. PayPal president Dan Schulman said: "This combination brings together iZettle's in-store expertise, recognised brand and digital marketing strength with PayPal's global scale, mobile and online payments leadership, and trusted brand reputation." Founded in Stockholm in 2010, iZettle started out selling credit and debit card readers that could be plugged into smart phones and tablets. It has more recently expanded with an e-commerce platform which tracks items such as sales and inventory for its customers. US-based Paypal was formerly part of eBay, but is now a standalone digital and mobile payments company. It claimed more than 200 million active customer accounts at the end of last year. It owns the peer-to-peer payments company Venmo, which is popular in the US, and last year acquired Swift Financial, which makes business loans. The firm said last month that it was considering additional acquisitions. It is facing increased competition as more companies, including Apple and major banks, improve their digital offerings. 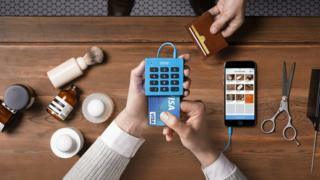 The tie-up with iZettle will increase PayPal's capacity with firms with physical retail operations.